"Drill one to drill two" Issac called over the radio. "I'm about finished here. I need to head back to base to drop off this shipment of ore boss." "Sure thing, drill one," Henry answered, "I think this asteroid is all mined out anyway. "Before you head back you two might was to look at these readings." Annette called over the radio from the other side of the asteroid. Henry pulled up Annette's stats on his ship's dashboard. "Are you seeing what I'm seeing boss?" Issac asked Henry. "Annette, from what I'm seeing, this looks like water. Is that what you are reading?" "Yes sir, it looks to be a rather large deposit of it too." "Ok, you both be prepared to drop your loads if we find liquid water. The station will pay handsomely for fresh water." Henry instructed. Annette watched the stats on her console as she continued drilling down through the rock to get to the water deposit. The pressure started building down inside the drill line. arning lights flashed on the console. "Keep going Annette," Henry advised. Light tremor readings began building on Issac's side of the rock. "Boss... I think we have a problem." Issac warned. "No problem, this rock's just going to fight us for it's spoils that's all." Henry replied. "Almost there!" Annette called out. The ground shook the drill ships and the team's instruments were flooded with information. Issac threw the switch to fire his thrusters as the mining tunnel beneath him collapsed and almost swallowed his ship. "We gotta get off this rock!" Issac yelled even though no one could hear him through the din of their own instruments. Moments later all three of their ships were thrown back into space by flying rock debris. Large chunks of the asteroid smashed into the three drill ships from all sides. Damage and proximety alarms rang out as the three of them tried to maneuver their ships out of the paths of the debris. Annette's instrument data disappeared off of Henry's dashboard as a particularly large chunk collided with her ship. "Dangit!" Henry swore through his teeth. He steady his ship and eyeballed her stat center for signs that she was ok.
"Boss... Is Annette," Issac asked quietly once he found a safe zone on a nearby asteroid. "I don't have sights on her, do you?" "Saw the whole collission Sir, She's adrift now. No stat data coming in." Lewis answered, choking over his words. "GREAT!" Annette shouted over the radio. "Dead as a doornail! My ship's engine took major damage from that hit boss." "Cesar's ghost Annette! What's your status? We can't read any stats from you over here." Henry called out, relief crackling through his normally level voice. "I'm ok sir, but you have to see this to believe it!" Annette answered. The debris slowly cleared to reveal a solid chunk of ice floating where their asteroid had been. 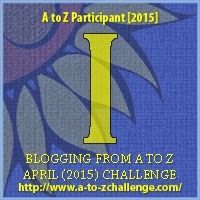 Today's post was inspired by the letter I. I is for: Ice as part of the Blogging from A to Z April 2015 challenge! Click on the letter to join on in the fun! As always... if you have something that starts with the letter J that you would like me to try to incorporate into tomorrow's short story, I'm always open to suggestions! Thanks for sharing. Just making my way around the challenge.